Hi Abraham usa nga tawo han bibliya. An susumaton han kinabuhi ni Abraham kaupod ha relihiyon han Kristiyanismo, Islam ngan Judaismo. Andrews, Stephen J. (1990). "Abraham". In Mills, Watson E.; Bullard, Roger A.. Mercer Dictionary of the Bible. Mercer University Press. p. 5. ISBN 978-0-86554-373-7. http://books.google.com/books?id=goq0VWw9rGIC&pg=PA5#v=onepage&q=Abraham+%22founding+father%22&f=false. Barr, James (2013). Bible and Interpretation: The Collected Essays of James Barr. Oxford University Press. http://books.google.com.au/books?id=xpg1xWbaycUC&pg=PP1&dq=Bible+and+Interpretation:+The+Collected+Essays+of+James+Barr&hl=en&sa=X&ei=U7s6Uq6rN8KWkwWVtIHYBQ&ved=0CDAQ6AEwAA#v=onepage&q=Bible%20and%20Interpretation%3A%20The%20Collected%20Essays%20of%20James%20Barr&f=false. Barr, James (1993). "Chronology". In Metzger, Bruce; Coogan, Michael D.. The Oxford Companion to the Bible. Oxford University Press. http://books.google.com.au/books?id=Y2KGVuym5OUC&pg=PA119#v=onepage&q=biblical%20chronology%20164%20BCE&f=false. Carr, David M.; Conway, Colleen M. (2010). "Introduction to the Pentateuch". An Introduction to the Bible: Sacred Texts and Imperial Contexts. John Wiley & Sons. http://books.google.com.kh/books?id=dJerjvlxCHsC#v=onepage&q&f=false. Coogan, Michael (2008). The Old Testament: A Very Short Introduction. Oxford University Press. ISBN 978-0-19-530505-0. http://books.google.co.uk/books?id=4OOrWwceuXcC&pg=PA23#v=onepage&q=%22James%20Ussher%22%20chronology%20abraham&f=false. Davies, Philip R. (2008). Memories of Ancient Israel: An Introduction to Biblical History - Ancient and Modern. Westminster John Knox Press. http://books.google.com.au/books?id=M1rS4Kce_PMC&printsec=frontcover&dq=Memories+of+Ancient+Israel&hl=en&sa=X&ei=4-86Uv6sDs2aiAf_9AE&ved=0CDAQ6AEwAA#v=onepage&q=Memories%20of%20Ancient%20Israel&f=false. Dever, William G. (2002). What Did the Biblical Writers Know, and when Did They Know It? : What Archaeology Can Tell Us about the Reality of Ancient Israel. Wm. B. Eerdmans Publishing. ISBN 978-0-8028-2126-3. http://books.google.com/books?id=6-VxwC5rQtwC&pg=PA98#v=onepage&q=%22respectable%20archaeologists%22&f=false. Enns, Peter (2012). The Evolution of Adam. Baker Books. http://books.google.com.kh/books?id=BNxeoqoTg-YC#v=onepage&q&f=false. Exum, Jo Cheryl (2007). Retellings: The Bible in Literature, Music, Art and Film. Brill Publishers. ISBN 90-04-16572-X. http://books.google.com/books?id=4bTVrpXSXe8C&pg=PA135#v=onepage&q=Biblical%20Art%20Abraham&f=false. Finkelstein, Israel; Silberman, Neil Asher (2002). The Bible Unearthed: Archaeology's New Vision of Ancient Israel and the Origin of Sacred Texts. Simon and Schuster. ISBN 0-7432-2338-1. http://books.google.com/books?id=lu6ywyJr0CMC#v=onepage&q=Biblical%20Archaeology%20Abraham&f=false. Hendel, Ronald (2005). Remembering Abraham : Culture, Memory, and History in the Hebrew Bible. Oxford University Press. ISBN 0-19-803959-X. http://books.google.com/books?id=IMsweVhMbaoC&pg=PA33#v=onepage&q=Abraham%20father%20of%20Arabs&f=false. Hill, Andrew E.; Walton, John H. (2010). A Survey of the Old Testament. Zondervan. pp. 2024–2030. ISBN 978-0-310-59066-8. http://books.google.com/books?id=WC80zxPIgyQC&pg=PA2024#v=snippet&q=Abraham+inheritance&f=false. Hubbard, David Allan; Sanford La Sor, Frederic William; Bush (1996). Old Testament Survey: The Message, Form, and Background of the Old Testament. Wm. B. Eerdmans Publishing. ISBN 0-8028-3788-3. http://books.google.com/books?id=6wSWpZmmlAoC#v=onepage&q&f=false. Hughes, Jeremy (1990). Secrets of the Times. Continuum. http://books.google.com.au/books?id=vPg2cvQLwHAC&printsec=frontcover&dq=Secrets+of+the+Times:+Myth+and+History+in+Biblical+Chronology&hl=en&sa=X&ei=_qk6UrqtMujwiAecvIB4&ved=0CDAQ6AEwAA#v=onepage&q=Secrets%20of%20the%20Times%3A%20Myth%20and%20History%20in%20Biblical%20Chronology&f=false. Kierkegaard, Søren (1980). The Concept of Anxiety: A Simple Psychologically Orienting Deliberation on the Dogmatic Issue of Hereditary Sin. Princeton University Press. ISBN 0-691-02011-6. http://books.google.com/books?id=MzMiPwAACAAJ. Levenson, Jon Douglas (2012). Inheriting Abraham: The Legacy of the Patriarch in Judaism, Christianity, and Islam. Princeton University Press. http://books.google.com.au/books?id=EUO2Mhd-drcC&printsec=frontcover&dq=Inheriting+Abraham&hl=en&sa=X&ei=tFo5UuLCLszFkwW53oCIDQ&ved=0CC4Q6AEwAA#v=onepage&q=Inheriting%20Abraham&f=false. Ma'ani, Baharieh Rouhani (2008). Leaves of the Twin Divine Trees. Oxford, United Kingdom: George Ronald. ISBN 0-85398-533-2. http://books.google.com/books?id=rVdhPgAACAAJ. May, Dann J (December 1993). "Web Published". The Bahá'í Principle of Religious Unity and the Challenge of Radical Pluralism. University of North Texas, Denton, Texas. p. 102. McCarter, P. Kyle (2000). "Abraham". In Freedman, Noel David; Myers, Allen C.. Eerdmans Dictionary of the Bible. Amsterdam University Press. pp. 8–10. 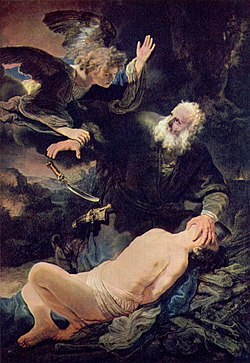 ISBN 978-90-5356-503-2. http://books.google.com/books?id=qRtUqxkB7wkC&pg=PA8#v=onepage&q=Abraham+Isaac+Ishmael&f=false. McNutt, Paula M. (1999). Reconstructing the Society of Ancient Israel. Westminster John Knox Press. ISBN 978-0-664-22265-9. http://books.google.com.au/books?id=hd28MdGNyTYC&pg=PA41#v=onepage&q=Abraham+patriarchal+%22known+history%22&f=false. Mills, Watson E. (1998). Mercer Commentary on the Bible, Volume 1; Volume 8. Mercer University Press. ISBN 0-86554-506-5. http://books.google.com/books?id=ym5rt115YtwC&pg=PA37#v=onepage&q=Biblical%20linguistics%20Abraham%20name%20meaning&f=false. Moore, Megan Bishop; Kelle, Brad E. (2011). Biblical History and Israel's Past. Eerdmans. ISBN 978-0-8028-6260-0. http://books.google.com/books?id=Qjkz_8EMoaUC&pg=PA19#v=snippet&q=Thompson+%22Van+Seters%22&f=false. Peters, Francis Edwards (2003). Islam, a Guide for Jews and Christians. Princeton University Press. p. 9. http://books.google.com.au/books?id=HYJ2c9E9IM8C&printsec=frontcover&dq=Islam,+a+Guide+for+Jews+and+Christians&hl=en&sa=X&ei=x-06UoHbLsSKiQeJm4D4BQ&ved=0CDAQ6AEwAA. Peters, Francis Edwards (2010). The Children of Abraham: Judaism, Christianity, Islam. Princeton University Press. ISBN 1-4008-2129-0. http://books.google.com.au/books?id=OaVf79Ui0i4C&printsec=frontcover&source=gbs_ge_summary_r&cad=0#v=onepage&q&f=false. Pitard, Wayne T. (2001). "Before Israel". In Coogan, Michael D.. The Oxford History of the Biblical World. Oxford University Press. p. 27. ISBN 978-0-19-513937-2. http://books.google.com/books?id=zFhvECwNQD0C&pg=PA27#v=snippet&q=oral+tradition&f=false. Shea, William H. (2000). "Chronology of the Old Testament". In Freedman, David Noel; Myers, Allen C.. Eerdmans Dictionary of the Bible. Eerdmans. http://books.google.com.au/books?id=qRtUqxkB7wkC&pg=PA248#v=onepage&q=biblical%20chronology%20date%20abraham&f=false. Ska, Jean Louis (2006). Introduction to Reading the Pentateuch. Eisenbrauns. http://books.google.com.kh/books?id=7cdy67ZvzdkC#v=onepage&q&f=false. Taherzadeh, Adib (1984). "The Death of the Purest Branch". The Revelation of Bahá'u'lláh, Volume 3: 'Akka, The Early Years 1868–77. Oxford, UK: George Ronald. ISBN 0-85398-144-2. http://books.google.com/books?id=3VhTAAAAYAAJ. Thompson, Thomas L. (2002). The Historicity of the Patriarchal Narratives: The Quest for the Historical Abraham. Valley Forge, Pa: Trinity Press International. pp. 23–24, 36. ISBN 1-56338-389-6. http://books.google.com/books?id=lwrzapZYqFAC&pg=PA23#v=snippet&q=%22Father%20of%20a%20Multitude%22&f=false. Wilson, Marvin R. (1989). Our Father Abraham: Jewish Roots of the Christian Faith. Massachusetts: Wm. B. Eerdmans Publishing. ISBN 0-8028-0423-3. http://books.google.com/books?id=RPyAG2cduiAC#v=onepage&q=Father%20Abraham&f=false. Ini nga pakli kataposan nga ginliwat dida han 02:37, 17 Abril 2017.